Bhubaneswar : India Saturday successfully conducted the first canister-based trial of its nuclear-capable Agni-V missile, which is capable of hitting targets over 5,000 km away. 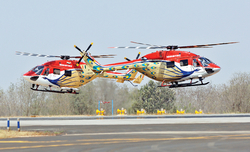 Prime Minister Narendra Modi called it "a prized asset". The surface-to-surface missile, which has the ability to hit targets deep inside China, was fired from a mobile vehicle at the Inner Wheeler Island launch site in Bhadrak district, about 200 km from Odisha capital Bhubaneswar, officials said. The launch came on the day Avinash Chander, who played a key role in the missile''s development, demitted office as head of the Defence Research and Development Organisation (DRDO) after his tenure was cut short by 15 months. "It is a canisterised version of the longest-range missile. It was tested for the first time from a canister. 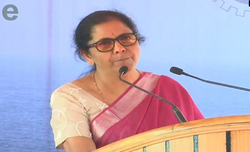 The test was successful," test range director M.V.K.V. Prasad told IANS. This was the third launch of the missile, but the first from a canister which would provide the armed forces with operational flexibility to pick and choose from where to launch the missile. A canister launch system of the 50 tonne, 17-metre-long and 2-metre-circumference missile gives the forces the ability to transport it by road and rail. President Mukherjee congratulated the DRDO on the successful test-firing. In his message, he said: "I extend hearty congratulations to all those associated with the successful test-firing of the third developmental trial of India''s indigenous Agni-V surface-to-surface missile. "I am happy to know that many new technologies relating to navigation and guidance, warhead as well as engine has been tried out in this version. I understand today''s test is also the first time the missile has been tried out in a canisterised version. Mukherjee conveyed his felicitation to the team of scientists, engineers, and others involved in the effort. "Our nation is grateful for their hard work and proud of their accomplishment" he said. Prime Minister Modi also congratulated the scientists. 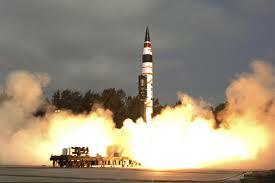 "Successful test-firing of Agni-V from a canister makes the missile a prized asset for our forces. I salute our scientists for their efforts," Modi said in a statement.